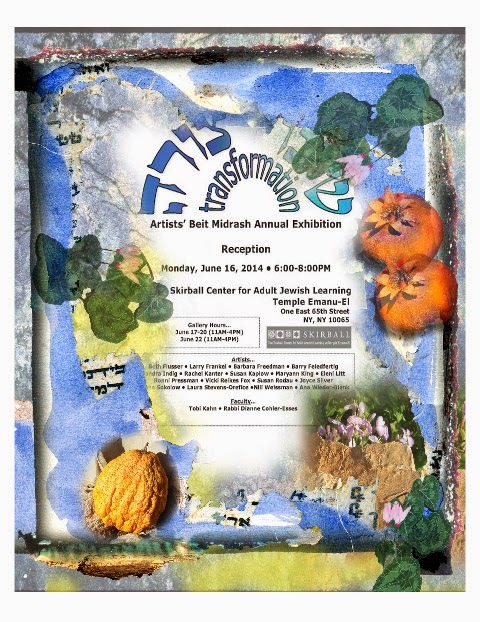 Transformations, an exhibition showcasing the works of 20 Jewish visual artists opens on Monday, June 16th at 6pm in the gallery space at Temple Emanu-El on Manhattan’s Upper East Side. The show is the culmination of a year-long program during which the artists studied Torah together and made art inspired by Jewish sources under the aegis of the Skirball Center for Adult Jewish Learning. A number of the participants in this Visual Artists Beit Midrash are well known in Jewish art circles, having shown their work in Jewish museums in the NYC area and around the country. The artists, who range in age from 30 to 70, come from across the spectrum of the Jewish community. In addition to their individual artworks, the artists have created a joint installation of mezzuzot of different materials and styles. Participating Jewish Art Salon members: Tobi Kahn (curator), Barbara Freedman, Sandra Indig, Rachel Kanter, Susan Kaplow, Eleni Litt, Ronni Pressman, Vicki Reikes Fox, Joyce Silver, & Arlene Sokolow. This is the b’nei mitzvah year for the Skirball Center’s Visual Artists’ Beit Midrash. Many of the artists in the current show have been participating for a number of years, forming an ongoing core to which new members are added each year. Transformations will be up for the entire week beginning on the evening of June 16th and ending on Sunday, June 22nd at Temple Emanuel-El, 1 East 65th St., NYC. The exhibit may be viewed from Tuesday-Friday and Sunday from 11 a.m. until 4 p.m. The opening reception on Monday, June 16th from 6 – 8 p.m. is open to the public.